I'm really happy to be starting my Christmas cards for the year. I have some lovely new images with which to make them. This one comes from Queen Kat Designs, a pretty little image called Christmas Girl by Milky Cat Studios. After coloring her with Copics (YR00,R05,G02,BG72 & B04), I framed her using a die from Spellbinders Nestabilities (Scalloped oval) and patterned paper from DCWV. She looks wistful, as if she's missing someone this Christmas season. Or perhaps she's impatient, waiting for the festivities to begin. She could even be waiting for the photographer to snap his picture for her annual Christmas cards. Regardless, she makes a pretty picture in her holiday dress, sitting in front of the tree. As far as the embellishments go, I pretended my card was a Christmas tree and hung all kinds of pretties on it!! Have you been celebrating the Queen's birthday with us this month? You only have a few days left to snag this awesome Christmas set. 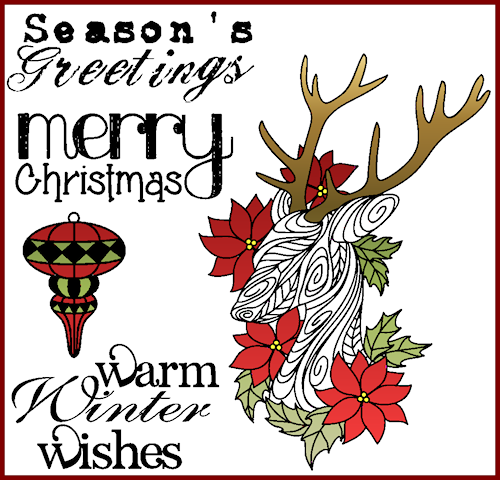 It is FREE with your rubber stamp order of $30 or more-offer ends on November 30!! Pat this is beautiful ! Adorable color on this Pat!